The Bose Wave SoundTouch music system is the Bestseller Speaker from Bose and available since years for a comparatively high price. In this test report we find out whether the high price is justified. The speaker can be controlled with a smartphone app. Some speakers come with an additional remote control. Usually, this is a simple display giving you information about the current mode or the track played back. This allows you to use a CD player or a MP3 player as a music source. Depending on the model, AUX and Cinch are available. Most devices have one to directly connect the speaker to your router. Usually, music is played back via Wifi. This will usually require you to use an app. Only few speakers can directly be paired with other devices. This is not always working reliably. Links to the server of the brand. We are not responsible for the contents. 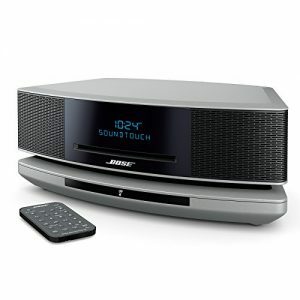 The normal Bose Wave music system IV is a durable and popular product from the Bose range. Curiously, it is only sold directly by Bose. It is the same with the Bose Wave SoundTouch music system IV. This is almost identical to the normal system, but offers additional wireless playback sources apart from the CD, FM/AM, AUX and DAB with Wi-Fi and Bluetooth. The price difference between the two systems is approximately €100. 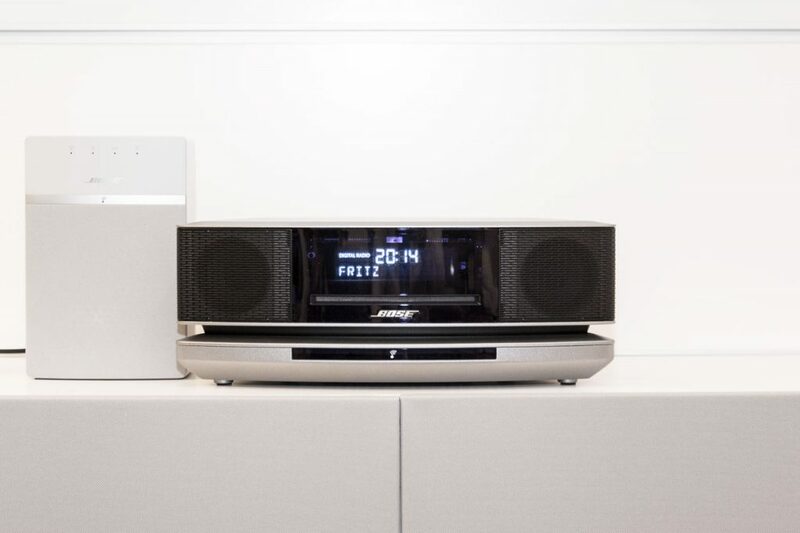 So, the Bose Wave SoundTouch music system IV is a real “humdinger”. Both those nostalgic for CDs, radio listeners and Spotify users will find what they need here, but they have to pay for it. What’s great: The device is available in three colors. White, grey and black. Once you've carefully unpacked it, you will notice that it looks a little different to the packaging. That’s right, because in the box there is a kind of double bottom/board with a base under it, which the Wave system can be placed on and both parts are connected with a cable. The system is now complete and ready to use. 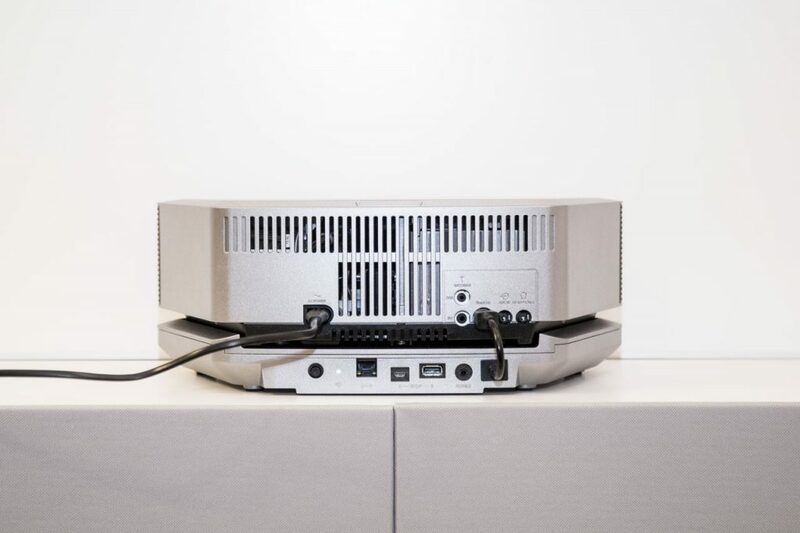 By the way, a normal Wave music system cannot be retro-fitted with a SoundTouch Base! The build quality is good but the plastics are a little rough and I really don't think they are up to scratch by today’s standards. Thanks to the internal power supply you only need to plug it into the socket and turn it on with a gentle tap on the top. This sensitive area is not clearly marked and at the beginning, I turned it off by mistake. Because a slight touch is enough to turn the device on or off. The alarm function is also switched off by means of this. If this gets too annoying, you can always disable the "touch behavior" in the settings. In the settings that are called up with the remote control via the display, the 12h or 24h clock is set. I find it a little awkward to move about with the small remote control and scroll through the menus. Fortunately these are things that you normally only have to do once. The normal time is set directly from the remote control. For this, simply "thumbs up" button for one second and then set the time with up/down. In case of power loss Bose specifies that it buffers the time for at least 48 hours. I just don't understand why the time doesn’t set itself automatically. After all, apart from DAB and Wi-Fi there are surely enough ways to transmit the time automatically. In addition to the time, the display brightness and bass can be regulated in the menu. For conventional radio reception you change the "Radio" button to radio mode. The tuning is done either by manual frequency search or by automatic tuning. The power cable ensures good reception. The reception can be improved if you lay it as long and as straight as possible. If reception is still not up to par, you can connect the wire antenna which is supplied. I prefer Digital Audio Broadcasting (DAB) due to the significantly better sound quality and wider channel selection. The nice thing here: all receivable stations are searched very quickly and automatically and are instantly available. The reception in my old building in Berlin without an antenna is great! Favorite stations can be stored in six touch keys (favorites). Unfortunately these can only be retrieved by the remote control or the SoundTouch App. On the device itself, there are no longer any buttons. I really can’t understand why! Because all the other Bose SoundTouch I have tested have loads of buttons and direct selection buttons on the device. An inconspicuous CD slot swallows up the silver disc collection. And in addition to audio CDs, MP3 CDs including folders are read. To let you know which track is playing, the display shows the ID3 tag information of each file. Since how to do this is well known, I will not go into further details on this playback method, and focus on the wireless playback options. 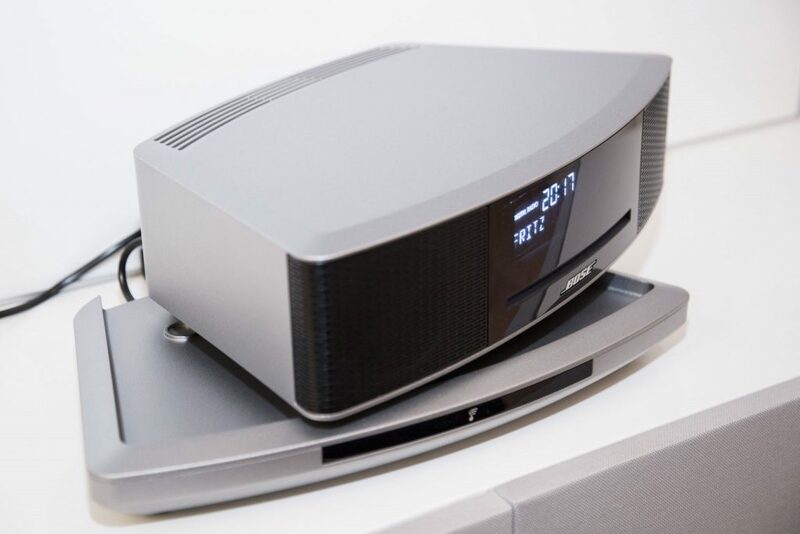 As mentioned above, Bose has extended a traditional Wave music system with the SoundTouch Base. With it, the system receives new connections and transfer options. Two different USB ports allow the device to be connected to a computer. But you don’t need that! Thanks to the free SoundTouch App for iOS and Android, the device can easily be set up wireless. Whoever has problems with Wi-Fi reception, can connect the device directly to the router. And for whoever prefers not to use Wi-Fi and wants to connect only by Bluetooth instead, the wireless function can be disabled completely. The Wi-Fi is controlled by a small button with LED. It’s a shame: the USB ports don’t allow any USB flash drives or hard drives to be connected! I will describe the detailed configuration and use of Wi-Fi and Bluetooth by means of the SoundTouch App in a separate Bose Sound Touch article, as this applies to all SoundTouch products. The SoundTouch App is available for Windows, Mac, Android and iOS. Digital Radio, Deezer and Spotify can be played without any fuss. Multiple SoundTouch devices can be grouped together and configured individually. This is much more convenient than using the remote control. But DAB and CD can’t be controlled by this! So if one day the battery is empty or you can’t find the remote control, you have a problem! It’s a shame also that you can’t use the Touch surface of the device to select titles with a simple swipe gesture. Sonos provides that same principle with the new Play: 5. 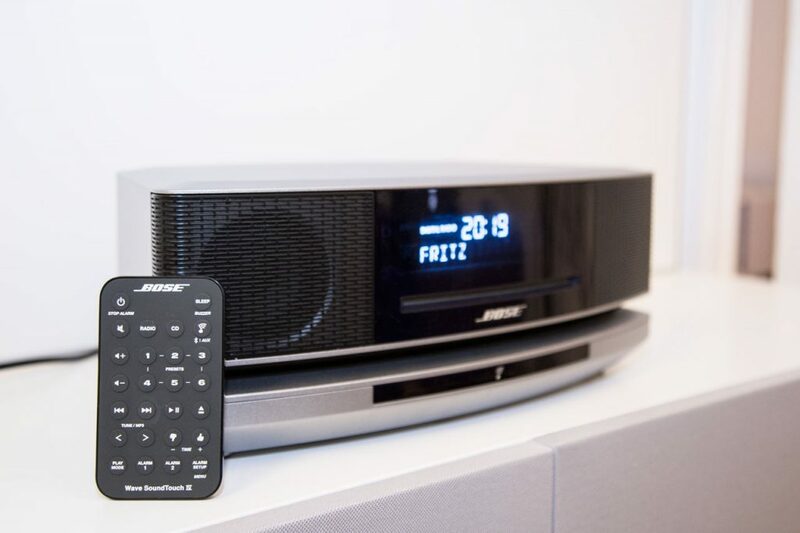 As an alternative you could use the Bose Control Pod that puts together the frequently used functions in an intuitive, wireless remote control that can be set up flexibly. But at 50 Bucks a throw, this accessory is just a little expensive. In a separate article I’ll present the Bose Wave Control Pod to you and tell you what to look out for. 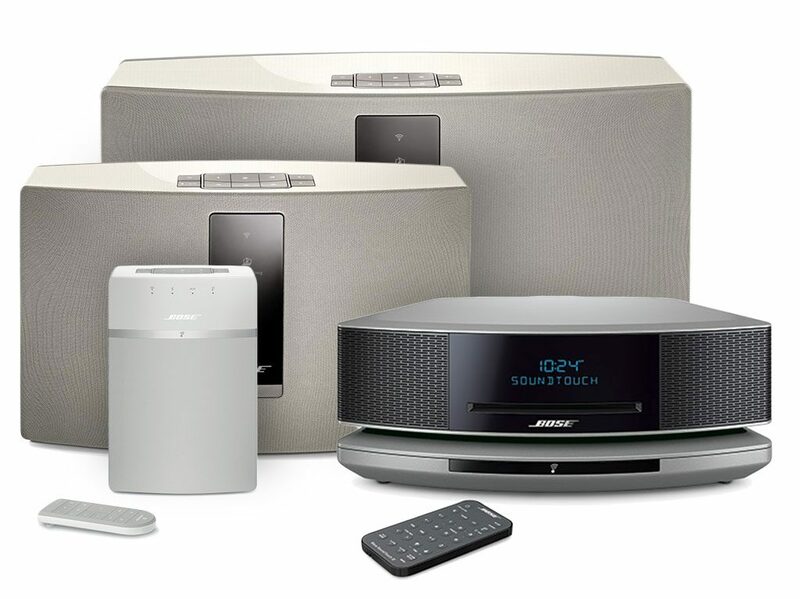 At Bose, SoundTouch is synonymous with the pairing of several so-called “wireless” speakers. These are the ones that only need electricity and transmit the signals via Wi-Fi or Bluetooth. In the fourth generation of the Bose Wave SoundTouch music system, Bluetooth is now finally available as an additional input source. If you don’t have your own router or maybe you just want to transfer music from your mobile phone, you only have to couple it with the speakers and then you can stream music in the best quality. This is all judder free but it’s still prone to interruptions. For a much more reliable transmission, the domestic W-Lan is the best. Then the SoundTouch App comes into its own and has a really nice interface, grouping together multiple SoundTouch speakers, so that all synchronize when playing the same music. How this works in detail is described in the Bose Sound Touch article. As already mentioned in Bose products only two music services are currently supported (SiriusFM is not an issue in this country). Although these are ideally integrated, but at least Tidal and SoundCloud should have been offered too. Tidal for HighRes music and Soundcloud for huge access to freely available music. But Bose has promised to provide more music services. And I’m sure that this will be the case in the near future. But at the moment, the selection is rather disappointing. Bose always loves to advertise its years of experience in the manufacture of loudspeakers. Expectations are therefore high. It also provides virtually no access to the sound configuration. It doesn’t have an equalizer or treble settings. Only the bass can be removed which is set to maximum by default. But in my opinion, there is nothing missing from this system. The sound is very clear and balanced. The bass is unobtrusive but harmonious. Nothing rattles and vibrates. Even at loud volumes it remains stable however the bass just can’t keep up. The trebles are then dominant and it doesn’t sound harmonious any longer. Therefore, this music system is really not up for loud listening. However, as you can use multiple SoundTouch devices in sync, you can still get some decent volume out of it. You should always think how small the Wave SoundTouch music system is! The whole sound is produced only in the upper structure. The lower part is just pure electronics. Accordingly, there isn’t much volume available on tap. Which SoundTouch speakers should I choose? The price is comparatively high and everyone should decide for themselves whether they need all the functions or not. But you can’t get DAB, CD and Spotify in multi-room compatible equipment anywhere else! Bose charges quite a lot for this exclusivity. Whoever can do without DAB and CD, would be well catered for with the Bose Sound Touch 30 and would get even more "oomph". By the way, you shouldn’t install the Wave music system in the bathroom. It’s not designed for humid environments. Great all-in-one system with just about every conceivable playing capability. The sound is very good and consistent. But it would have been better to have buttons on the unit and more music services available. How does the multi-room system by Bose (3rd generation) work? I am an hifi enthusiast since years. When i discovered the multiroomtechnology i knew this is the next big thing. I wanted a own wifi speaker but was disappointed from the overall performance so i took the next speak and so on. The results of my experiences are collected on this site.